Graham Hill drove an immaculate race at the Nürburgring to take the German Grand Prix from John Surtees and Dan Gurney, who both mounted a strong challenge throughout. Hill was forced to drive his old BRM after the new car was written off in a high-speed crash the day before. With only 30 minutes remaining of official practice on Saturday, Hill was speeding down into the Fuchsrohre Dip, when he hit a television camera that was lying in the centre of the track. It had fallen off the back of privateer Carel Godin de Beaufort's Porsche. Hill recounted; "I was going downhill at 140 mph on maximum revs when I saw part of a camera lying in the road. I couldn't move offside and ran over it. It pierced an oil pipe under the BRM and threw me straight into a ditch. I tore along for 100 yards and saw one of my wheels 30 yards in front of me before I stopped. The car is a complete write-off." Tony Maggs, whose Cooper Climax was racing close behind Hill, was also very lucky to escape without injury. "I hit the patch of oil from Hill's car and just spun off into a hedge", said Maggs. "There was nothing I could do about it. The car is badly damaged, but it may be repairable. It was the narrowest escape I have ever had on a racing circuit." 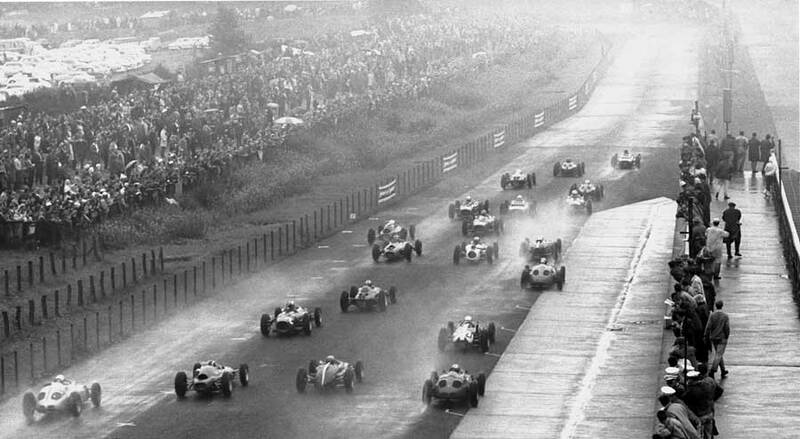 The day of the race was wet and stormy and the start was delayed by over an hour as a downpour flooded the track. Eventually 26 cars lined up on a rain-sodden grid, with Clark, Gurney and Surtees on the front row. Clark had forgotten to switch on his fuel pump, so was left standing on the grid, leaving Gurney to storm into an early lead. Hill squeezed past him at the beginning of the third lap, and from then on the dark green BRM stayed in the lead throughout. Hill was constantly hassled by Surtees in the Lola, who had moved up to second by the sixth lap, but, driving calmly and confidently, managed to maintain his advantage. Jack Brabham debuted a car carrying his own name, the former champion having earlier raced a private Lotus, but he retired with throttle problems, the car needing further development. Hill hung on to beat Surtees by just 2.5 seconds, with Gurney only 1.8 seconds behind in third. Clark, after his abortive start, drove brilliantly to take fourth. Hill described the race afterwards as one of the hardest he had ever been in, but also one of the best drives of his career so far. "I was well aware that I could easily make a mistake in the wet. I had to concentrate like mad and by the time the race was over, and I had won, I was completely drained both mentally and physically. It was one of the best races I'd driven up to that point." Hill now had a seven point lead in the world championship, ahead of Clark and Surtees.